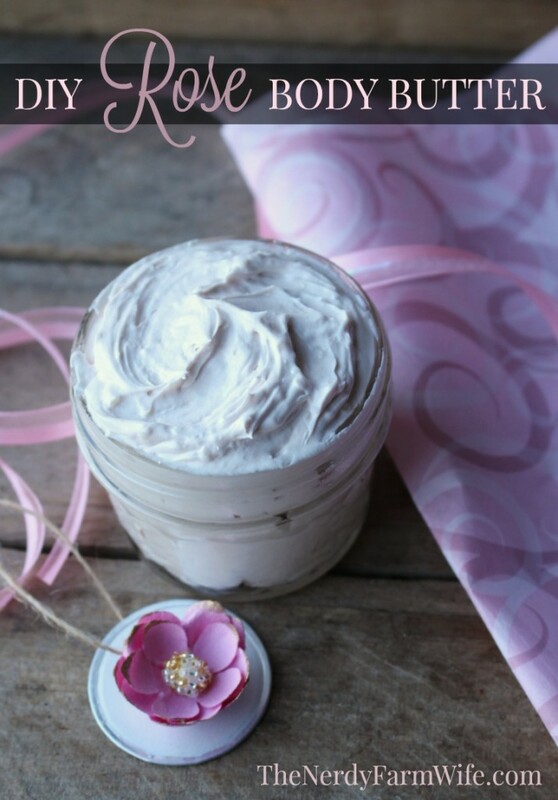 This luscious body butter is so rich, so moisturizing… it has quickly become a new favorite of mine! I adapted it from the wonderful whipped body butter recipe found HERE on the Soap Queen blog. I love that it’s super easy to put together – no melting, no chilling, no complicated steps. I loaded my version up with wrinkle fighting rosehip seed oil, skin nourishing mango butter, rose petal infused sunflower oil, and then lightly tinted it pale pink with a smidge of rose clay. You can buy the ingredients you need for this project at BrambleBerry or Mountain Rose Herbs. Place the avocado, shea or mango butter in a mixing bowl. Butters can vary pretty widely as far as how soft or hard they are – you want a butter that’s on the softer side for this recipe. The original recipe suggests that you use a stand mixer; however, I don’t own one so made do with my cheapo hand held cake mixer. It worked great; I just had to remember to stop it every so often so it wouldn’t overheat. Begin mixing the butter, gradually increasing speed until it’s light and fluffy. Add the sunflower oil, rosehip seed oil, tapioca starch, rose clay, and essential oils. Note: If you’re allergic to sunflower, just substitute with another light oil such as avocado, olive, meadowfoam, jojoba, etc. If you don’t have tapioca starch on hand, you can try substituting arrowroot or corn starch instead. 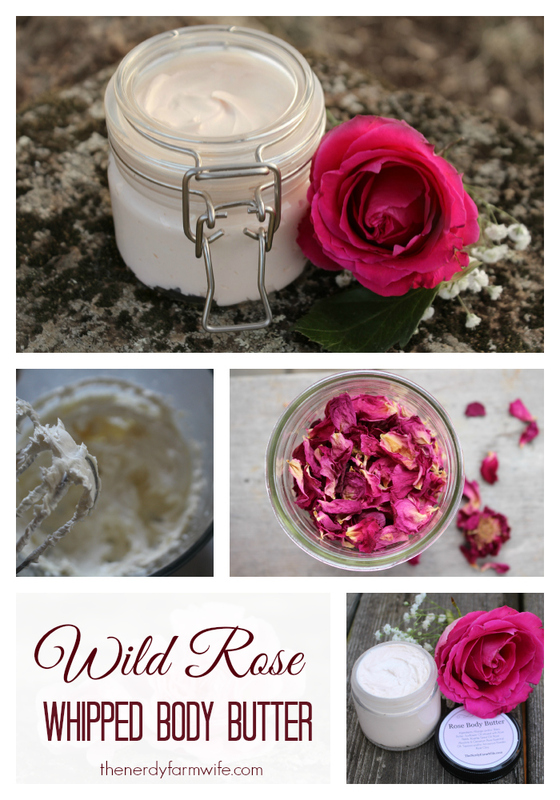 The rose clay adds a pale pink tint to the body butter; you can leave it out or replace it with a bit of alkanet root infused oil, if you’d like. For scent, you can use all Rose Absolute or all Geranium (Rose) essential oil; I only combined the two, since I had both on hand. Geranium gives a nice rosy scent, usually at less cost than rose essential oils. Resume mixing, starting on low then gradually increasing speed. Spoon into jars and cap tightly. This recipe makes plenty to share! It will fill about 7 or 8 of the small 2-ounce jars as shown in the photo below. Did you enjoy this DIY body care recipe? Be sure to sign up HERE for my newsletter, so you can get my latest soap ideas, herbal projects and other DIY recipes sent straight to your inbox each month! If you like the recipes on this site, you’ll love my book! Tagged body butter, creams, rose, roses. Bookmark the permalink. Hi Jan! Thank you for sharing these wonderful recipes! I am curious to know what method of cleansing you use for your skin? I have been thinking of trying the Oil Cleansing Method? Have you had any experience with this? I think the oil cleansing method sounds lovely though and it would be at the top of my list for testing out if my tried-and-true method stopped working for some reason! I use a mixture of half Castor Oil and half extra virgin Olive Oil, it only takes a little I massage onto my face leave for a few minutes as time allows and then run a washcloth under hot water wring it out and let the cloth steam my face until it no longer feels warm then wipe the oil off. I really have dry skin and still moisturize as well. Hi Bernette! That sounds so nourishing – I bet it feels great! My dad has very sensitive skin, he gets skin sores on his elbows and knees as he works construction… On top of that he has that skin condition were you loose pigment and get “albino” spots…. For the second there’s no cure, but he found an infused water that works a treat with sunshine. But for the skin sores there’s no cream on earth to help him…. I want to make him something… to try and help… Would you have any recipe already posted? Or would you be so kind to help me create one? Hi Estefania! I’m not very familiar with that condition; I’m so sorry that your dad has to suffer from it! Off the top of my head, I would suggest trying out a salve or cream with tamanu oil if you haven’t already; maybe put some rosehip seed oil in it as well? Those are two of my favorites for showing visible results. I have a healing salve recipe here that is useful for all sorts of things: https://thenerdyfarmwife.com/herbal-healing-salve-recipe/ you might could use that as a base for your recipe. Best wishes to your dad – I hope he’s able to find some relief! But thank you ever so much for your help and kindness. Hi again Jan, just one other question, in one of your salves you use Golsen seal to infuse an oil, and then prepare the salve. I found it in root powder and tincture with drop dispenser…. Which one should I use? Hi Estefania! You don’t want to use tinctures in salves because the water/alcohol won’t mix with the oils and will seep right out of your finished product. Root powder would work to infuse your oil – just be sure to shake it well every day if you can because powders tend to settle and compact in the bottom of the jar more than larger pieces of herb. What is the shelf life on this rose body butter? Hi Sally, Since there is no water component, it’s pretty shelf stable. It depends on the quality and types of the oils that you start with, but it should keep well for at least 6 months & probably much longer. It will settle a bit over time, but that’s just an appearance change & it’s still fine to use. Thanks Anne-Marie! You created the best body butter recipe EVER. I am thoroughly hooked on it. :) Thank you so much for the goodies and allowing me to share my rose version with my readers! Jan-I tried making my own body butter using raw shea butter, coconut oil jojoba oil & lavender essential oil. First off, the shea butter stinks! Even after adding more lavender–it just smells, but after having invested so much $, I am using it anyway. I am very disappointed that my skin feels so dry. Every site had testimonials about how improved & soft women’s skin was after using these ingredients–not my experience :( Any thoughts? Hi Amy! I like using unscented, refined butters myself, especially for creams and body butters – I know some people like them, but I agree with you about the strong smell that the raw versions can have. Which recipe did you use? Did you add any starch or clay? If so, what types? My first thought about your combination of ingredients is that coconut oil could be the problem. It’s kind of the “it” ingredient right now, but quite a few out there are allergic to it or find it super drying to the skin. In fact, I would love love love to figure out a good soap recipe (outside of castile) that doesn’t use coconut oil, because so many people write me that are allergic to it and are stuck finding a soap they like. If you let me know the exact recipe/ratios you used, I can see if there’s any other ideas that come to mind. I’ve just found a new favourite website! Thank you Jan for all the lovely goodies on your page. I can’t wait for my rose petal oil to finish infusing so I can make the rose butter and salve. Thank you so much! Thank you so much for lovingly sharing all of these great recipes with the public. I have really enjoyed your whole site and have tried a few of your recipes with success! Thank you. I was really excited about this butter and tried it, but I don’t feel like it went so well. For starters I sub’d shea butter for the mango because I didn’t have any. I also sub’d cornstarch for the arrowroot powder for the same reason. My end product is runny with tiny gritty pieces from the shea butter. I did “whip” as you instructed and it did get smoother, but I couldn’t get the grainy bits to go away. I will still use it of course because there is a lot of money in there, but I was wondering if you had any suggestions on where I went wrong. I did not use any clay because I didn’t have any. Was that for color only or do you think it would have added to the “body” of the cream. It does smell lovely though. Thanks! I made the body butter with Shae Butter. It was pretty greasy. Also my butter wasn’t as creamy as your picture shows.how long should I blend it. I think I blended with a hand mixer for about two minutes. Hi Colleen! You want to beat it for more than two minutes with a hand mixer – more like 5 minutes, or even longer. It should be really light and fluffy when done – like a light icing almost. Adding more arrowroot powder might help too. Hi, i have all the ingrediants except the rose clay could I use a differant clay like green organic clay instead? Hi Lou! I’ve tried green clay in body butter before thinking I would get a pretty mint green, but it turned kind of an odd, dirty looking shade instead. I would just skip the clay in this recipe since it’s mostly added for the pretty pink color. I really want to make this body butter. Do you think this bottle will work? Hi Dian! That’s a great question – I’m not really sure how it would work in a pump style bottle. It’s pretty thick and creamy, but you could always try it out and see! If you have a spare drinking class on hand, you could make the recipe and store it in there, just put some plastic wrap or a baggie fastened on with a rubber band on top as a seal and you’d be good to go! I made this recipe but when I go to apply it the butter feels like rubbing sandpaper on your skin until it warms enough to melt the gritty bits. There are tiny white beads. Do you have this issue? I used mango butter as well. Also the clay seemed to leave small specks of red, I thought it would be fine enough. Any other way to tint it? Thanks so much for getting back to me! I just bought this mango butter and haven’t used it before this. The weather is cold where I am so not sure about the temperature of it being shipped to the company etc. My body butter is very light and airy but I’m thinking maybe I didn’t whip the mango butter enough on it’s own? I didn’t want to over whip it but I probably didn’t even whip it for a minute. Would that have helped get rid of the grains? Or it I heated it to melt it first? I was thinking of heating my batch of butter until just melted and then cooling and whipping again. Think this would work? Now I’m going to try your rose cream! Great recipes! Love your site, just discovered it! Alkanet infused oil is a great idea, but how do you strain your herbal infused oils? I tried a coffee filter but it took forever, any tips? Hi Jessica! It usually takes more than one minute to whip the butter I’m using, but it probably depends on the temperature/softness it starts with. You could try tempering your mango butter – here’s a post I found that I think will help you do that: http://swiftcraftymonkey.blogspot.com/2011/10/question-heating-and-holding-butters.html I hope it helps! To strain herbal infused oils, I use a very fine metal mesh sieve. It’s actually one that my mom had for years & then gave me when I got married. It’s probably at least 20 or 30 years old! But, I’ve seen similar in stores. It gets most of the big stuff out and any fine stuff just settles to the bottom and I carefully pour out the oil, not disturbing any bottom sediment. Hi! Thank you so much for your blog and recipes. I have a couple of questions. It says tapioca powder in the recipe but your comments say arrowroot? what is the difference in feel and which do you prefer? Also, I know this is unrelated to this post but I thought id keep it all in one comment, in your cp recipes it always says you add extra tablespoons of luxury carrier oils at trace. What is the rate of those PPO and are these calculated into your superfat? Do you do your recipe at 0% superfat/lye discount and then add the oils at trace or do you do a regular 6-9% superfat AND add the oils at trace? Also what rate do you use rosemary extract? I want to add hemp, evening primrose and other oils with very short shelf lives to my cp but fear DOS. and do you use rosemary oleoresin or rosemary co2 extract as I’m confused between the two. Sorry to bombard you with questions, I’m trying to learn as much as I can in preparedness for my cp soap making! Hi Lynnie! You can use either. Tapioca powder is really nice, but I have to order it online (from brambleberry.com), whereas arrowroot is easy to pick up in a grocery store with a gluten free section. I can’t really tell that much difference, to be honest! On my older soap recipes I call for adding extra oils at trace, since that’s how I learned to make soap, but I’ve fallen away from that practice and just include everything at once in the recipe. (Supposedly, people that study these things say it doesn’t make a noticeable difference in the outcome, when you add those extra oils.) I like to keep my soaps at 6% superfat since that’s what our family’s skin likes, but the extra oils would notch it up more like 7%, depending on how much I added. Oh okay! So you’re saying you don’t do that anymore and just include any luxury oils in the overall recipe at a small percentage? I liked the idea of it for more expensive oils like rosehip, tamanu etc but I suppose it’s the same if you just put those at say 1-3% of the recipe. I read other places that said it was the same either way so I guess ill just do that-especially if you agree! And I ordered rosemary oil extract from From Nature With Love- but I’ll try MHR next time – I love them! Thank you so much for your time! I’m ordering all my ingredients now and about to get started and your blog has been a tremendous help! I really appreciate what you do! I’m thinking about starting a little free soap-making blog just to keep track of my recipes and techniques and outcomes and picures of each- as I’m so disorganized with paper documents! They’d end up lost forever in my vast collection of soap research, haha! I made this recipe and it was great. At first it came out light and fluffy, but after about one hour it looked like a chocolate mousse. Can you give any suggestions on how I can keep it light and fluffy? Hi! Am new to this site it’s Awesome. Am learning alot off thing.. I have Lupus and I get a lot off brown spots on my face and in the summer even worse I have tried lots off cream. Can you help me?? Hi Mary Jane, I’m happy that you’re enjoying the site! I’m so sorry about your lupus and the brown spots; I have a friend who has the same and has tried a lot of things too. It’s such a complex disease; I’m afraid I’m not really sure of anything helpful to tell you. There are a few oils/things that I know of that are supposed to help lighten age spots or repair skin in some way, that you could try and see if it does the same for lupus-triggered spots: rosehip seed oil, castor oil, tamanu oil and using diluted apple cider vinegar as a toner. You could also try washing your face with raw honey. (Just rub it in, let it sit for a minute and then rinse off with warm water.) These are just a few ideas that shouldn’t interfere with any medications you’re on (though you can double check with your doctor to be sure). I wish that I had better advice for you, but I hope that you’re able to find something that helps! 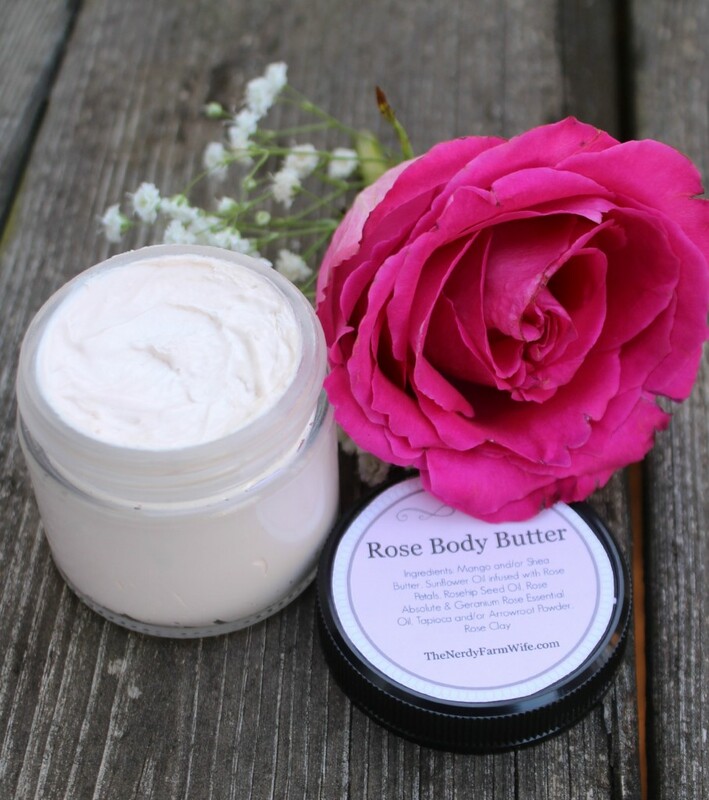 How long will the Rose Body Butter last? Should it be refrigerated? Hi Penny! Since body butters don’t have water or another liquid in them, you don’t have to refrigerate them and they’ll last a lot longer than creams or lotions. (Water in a product, is where the bacteria and mold grow.) Your body butter should stay fresh for at least 6 to 9 months and maybe longer, if stored out of direct sunlight and high heat. It will also depend on the quality of the oils you start with. If your oils are past their prime, the body butter might develop a rancid or old oil smell sooner. Body butters also tend to slowly deflate over time. If this happens, you can scoop it out and whip it again, to return it to its fluffy state. Hi Jan! Are body butters to be used mostly at night due to sun exposure during the day? I also have the same question in regards to body salves. By the way, I have decided to take an herbology course and it is you and your wonderful recipes and ideas that inspired me to do so. So thank you so very much for everything you do. Jan, love your website + recipes. What is the purpose of the tapioca starch in your body butter? What does it do exactly? Hi! How can I obtain the tinge of pink in body butter if no rose clay is available? Can I blend rose petals in the mixture? Hi Kavitha! Do you have access to alkanet root powder? I sometimes use a tiny bit mixed or infused into oil to tint lotions, creams & body butters a natural shade of pink. Unfortunately, if you blend in rose petals, they’ll eventually turn brown in the body butter.